Progress being made on the motorway overbridge north of Paekākāriki (Bridge 2). Welcome to the July 2018 construction update for the Transmission Gully motorway project. With the completion of retaining walls and abutments, and the placement of bridge beams and barriers, many of our structures are really starting to look more like the finished product. The traffic switches at both Mackays Crossing and Linden are getting much closer as work continues in both areas. Make sure you keep an eye on our newsletters so you know what to expect. 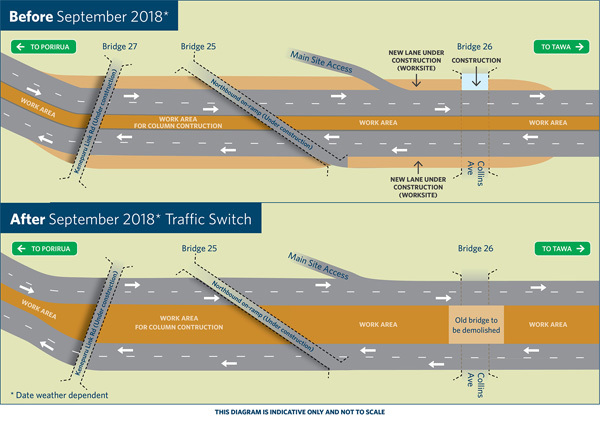 A traffic switch in September will move southbound traffic over from the existing Collins Ave overbridge to the first section of the new overbridge (Bridge 26). As part of this work, in August we will be making the road wider on each side of the motorway south of Mungavin Interchange to just past Tawa College. Young Kanuka seedlings waiting to be planted out in the northern zone. While we planted some small areas last year, this season we are really ramping up our extensive planting programme. By the time the motorway opens, we will have planted in excess of two million plants. Tom Puxley, CPB HEB JV Project Engineer onsite at Transmission Gully. In the latest radio interview, Tom Puxley, CPB HEB JV Project Engineer talks about seismic resilience design factors and the building of Bridge 26 at Collins Avenue in Linden.